A hand-drain animation by Utrecht-based visual artist Johan Rijpma in which a line is extrapolated through a grid and as the line goes beyond the grid's boundaries, the hand deforms and divides into different segments through the subtle rotation and perspective shift of each segment of the hand moving in a slightly different direction. Beyond each boundary the extrapolation of movement is causing deformation in a systematic but speculative way. In this “Straight-Forward” way of animating, each drawing is only based on the previous drawing. Forgetting to trace a certain part will make it disappear for all the following drawings. The animation process therefor seems to express qualities that can also be found in the limitations and risks of an extrapolation process that goes far beyond it’s observations. This paper extrapolation was done by intuitively repeating and stretching the shapes that would emerge from the initial crumpled paper composition. 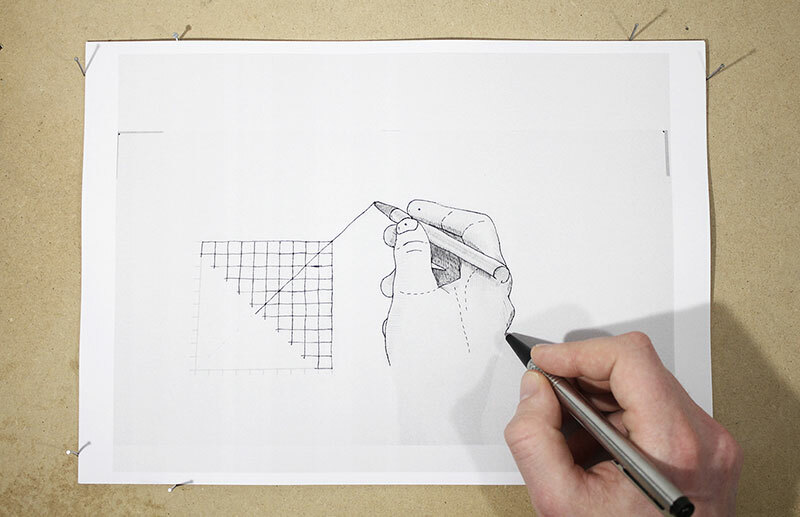 A hand-drain animation by Utrecht-based visual artist Johan Rijpma in which a line is extrapolated through a grid and as the line goes beyond the grid's boundaries, the hand deforms and divides into different segments through the subtle rotation and perspective shift of each segment of the hand moving in a slightly different direction.